There are many people who use their mobility scooter or wheelchair both at home and away. While travel scooters and portable electric wheelchairs are available, they often are less durable, have a shorter range, and have fewer features than their larger non-portable models. For this reasons, most people who use their mobility vehicle on a daily basis will opt for a full featured non-portable unit, turning to a vehicle wheelchair lift for their transportation needs. Vehicle wheelchair lifts can typically be divided into two categories: internal and external. Internal wheelchair lifts are mounted on the inside of the vehicle and store the scooter or wheelchair inside the vehicle. Some use a crane like wench system to hoist the wheelchair or mobility scooter into the automobile. These are most commonly used by people who wish to transport their mobility scooter or wheelchair in a car. This is because the crane can typically be mounted in the trunk area. The other type of internal wheelchair lift is the platform lift. These provide a platform that can be extended from the automobile. When the platform is fully extended it will rest on the ground and the scooter or wheelchair can be subsequently positioned on the platform. The platform is then raised and the wheelchair or scooter is moved into the vehicle. These kinds of lifts are often used in the middle compartment of a van or the rear of an SUV. The advantage offered by an internal wheelchair lift is that it allows a mobility vehicle to be stored inside the automobile, protecting it from the elements. This comes at the cost of space and will require a semi-permanent installation. Some people instead prefer to go with an external wheelchair lift, which can be installed in only a few minutes. 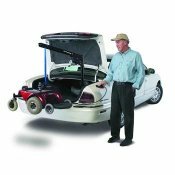 External wheelchair lift attach to the hitch of a car, truck, SUV, or other automobile. They usually use a platform design similar to that of an internal wheelchair lift, but the scooter or wheelchair is stored externally. This frees up space inside the automobile and these kinds of lifts can be quickly and easily removed. A wheelchair lift can make it much easier to transport a scooter or wheelchair. Often the type of automobile used will play a big role in determining what kind of wheelchair lift to go with. They type of mobility vehicle being transported also plays a role in determining what type of wheelchair lift is the best choice. People use wheelchair lifts everyday to make transporting mobility vehicles much easier. Depending on the model, these devices are designed to support well over 400 pounds, so there should be a lift available for all types of mobility vehicle, no matter the size.